Hi guys! Welcome back to another installment of Nibs & Nails. 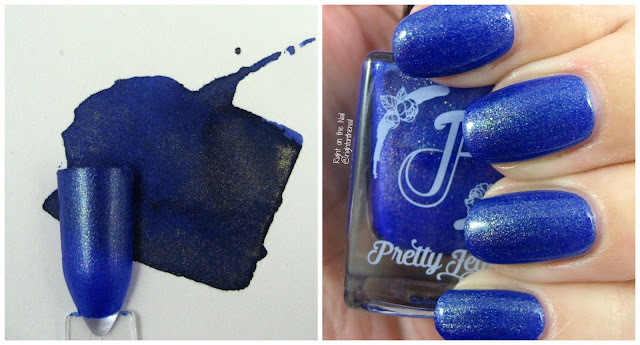 You know, where we ask popular indie nail polish brands to dupe (or just be inspired by) fountain pen inks with shimmer or sheen. This post was supposed to be up on Friday, but life happened. Work was really crazy on Friday and I just couldn't even focus on editing photos. 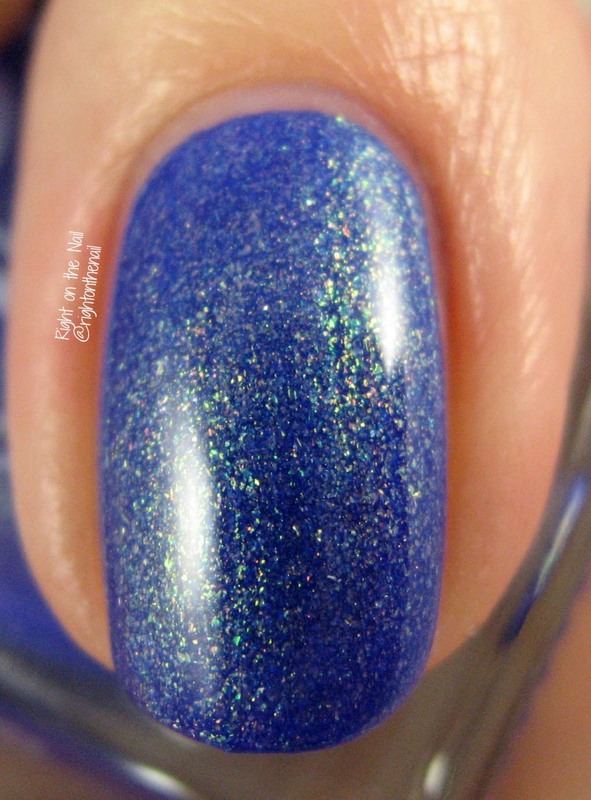 I hope this beautiful polish from Pretty Jelly makes up for my tardiness. This ink may look slightly familiar to you because I've shown another ink that is a dark blue with gold shimmer from Diamine called Shimmering Blue Seas. 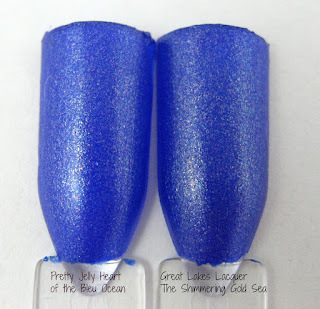 Mariah from Great Lakes Lacquer made that one, and later in this post I'll show you how the 2 polishes compare. Pretty Jelly is a brand I didn't know that much about until recently. The owner and maker, Liz, started out as a nail blogger (Liquid Jelly) and started making polish back in 2012. Now that I've had the chance to try them, I definitely need to get some more! As always, make sure to check out my husband's ink blog, Inkdependence, to see a full review on tonight's ink from J. Herbin called Bleu Ocean. The ink is a dark royal blue that is almost a navy color in the saturated spots. The shimmer ink both the ink and nail polish is more pronounced in real life when compared to my photos. Overall, the polish may be ever-so-slightly lighter than the ink, but it's still really close! There's that beautiful shimmer! The shimmer is almost more of a flakie shimmer that has a little purple/pink in there. Oh, and the formula was amazing! It had almost a whipped formula that was a breeze to apply. Since this is more of a jelly formula (which makes the brand name even more appropriate!) I thought it might need 3 coats, but it was almost a 1 coater! So how does this compare to Great Lakes Lacquer polish The Shimmering Gold Sea from several weeks ago? It's closer than I thought it'd be! The Pretty Jelly polish is a jelly while I found The Shimmer Gold Sea more of a crelly. The Shimmering Gold Sea is also a little darker with a bit more purple to it which can also been seen in the inks as well. So there you have it, what do you think? Liz did a fantastic job, and I can't wait to make an order! For more information on Pretty Jelly, check out their website, Facebook, Intagram, or Twitter pages. I love this series! Any chance that this may be released for us to buy? I would love that! Thank you so much! I don't think she plans on releasing it, but I know she does customs for people so you could probably get a bottle if interested!